5 Curriculum: Public or Not? All the curriculum is built under the Develop tab. Click on Create New Folder button at the bottom left. It will add a folder called 'New Folder'. Click on the 'New Folder' in the left column. Click on the bold words New Folder, on the top bar. 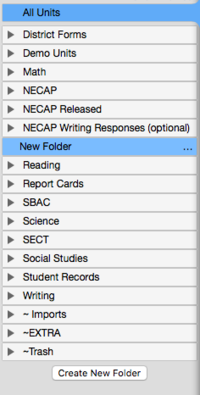 It will drop down a section where you can edit the folder name, and assign Type, Grade, and Subjects (optional at the folder level). Type in the real name of the folder and hit Save. You will see a 'Changes successfully saved' message within a green background appear at the top, with the folder renamed. From here, you can 'Create New Folder' or 'Create New Course' (see top right bar). Select the folder you want the new curriculum course to be part of. On the bar at the top right, click on 'Create New Course' and a 'New Course' will be created. In this example, I added this course to a folder called 'Sample Folder'. Initially, that folder was empty and didn't display any triangle in front of it. Now, it has a triangle, and it's outlined in blue to indicate that the course I'm on right now is part of this folder. To edit its name and assign a Type, Grade, and Subject (if not already inherited from the parent folder), click on the bold words 'New Course' on the top bar. From here, you can 'Create New Unit' (see top right bar). Select the unit you wish to use as your starting point. If the unit you selected has multiple versions (eg Current, Woking, ...), make sure to select the version of the unit that you want to duplicate. Once the version you want to duplicate is selected, click on Copy, in the top menu bar, then select 'Copy Version to New Unit'. This will create a duplicate of the unit. By default, the unit name now bears the word 'Copy' and is the one selected. If the copied unit you just created needs to be moved to a different location, you can use the MOVE option. By default, the unit inherits the Type, Grade, and Subject from the course and/or folder in which it is located. To edit that information and/or the unit name, click on the bar at the top right of your window - where the unit name is listed in bold letters. When you click on that bar, it will open a drop-down window to allow you to edit the information. Any gray checks are inherited and can't be removed at this level. To edit any gray check, you will need to go to the level(s) above (e.g. course, folder) and uncheck at the level the information has been set. Blue checks indicate that they have been set at the level that you're at and can be removed. Go to the To view/edit Type, Grade, Subject section for more details. Make any changes needed, and hit the Save button. - Approve the unit to have it visible to users and ready for data entry. Select the course you want the new curriculum unit to be part of. Click on 'Create New Unit' at the top right on the bar. If the course and folder where the unit is going to 'live' do not already have a Type, Grade, and Subject assigned, you will get prompted and will need to assign them before you can edit this unit. Type in the real name for this unit, check the box(es) for the appropriate Type, Grade, and/or Subject, and hit the Save button. In this example, the new unit is called 'Sample Unit', and as you can see on the top bar, it has a Type (Local Assessment), a Grade (4), and a Subject (Reading) assigned. This new unit is a Working Version. - Approve the unit o have it visible to users and ready for data entry. From the new unit you just created (Working Version), on the Curriculum tab, you have a Description field where you can type more information about this unit. From this working version, you can click on Preview, at the top, to see what the curriculum page will look like when this new unit is approved. Standards for this unit will be listed on this curriculum page after they are linked to criteria in the rubric. From the new unit you just created (Working Version), click on the Assessment tab. You can mark this unit as required by checking its Required box. The Task field lets you type in information about what this assessment is and how this assessment should be administered. The Materials section allows you to specify what is needed for this assessment. Additional Directions is a field where you can add any pertinent information that may not have been covered by the other fields. From this working version, you can click on Preview, at the top, to see what the Assessment page will look like when this new unit is approved. 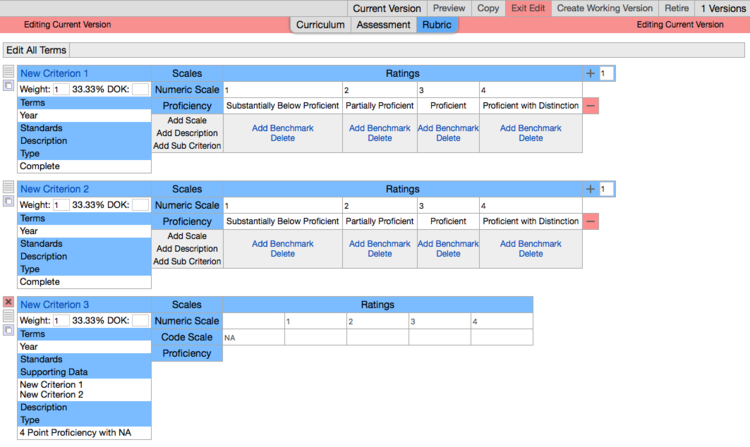 From the new unit you just created (Working Version), click on the Rubric tab. Click on the Add Criterion bar to add a criterion. By default, when you add a criterion, it is of type 'Complete'. If you wish to change that type to a pre-defined type, click on the word 'Type' and it will bring you a list to choose from. The most popular ones are the 4 Point Proficiency with NA, Numeric Sum, Date, and Note criteria. IMPORTANT: Keep in mind that pre-defined criteria don't have the same flexibility as the 'Complete' type and may not allow you to add features like a description or a scale for example. To change the criterion type, click on the one you want from the list and the system will automatically change it. There is no 'undo' or 'back' button on this, so make sure that you really want to change the criterion type to a pre-defined one before clicking on the new type. Hit Cancel if you do not wish to change the type. The information about the criterion type only shows in Edit Mode (e.g. Working version or Edit mode on a current version). To set the name of this criterion, click on the words 'New Criterion _' and it will open up a text field. Type in the criterion name then click Done. If the criterion will have a score, you will need to add Ratings. By default, +1 is set and if you click on the +, it will add one rating, starting at a possible score of 0. You can keep clicking the + to add one rating at a time or you can change the 1 for the number of ratings you wish to add before clicking the +. If the possible score for this criterion does not start at 0, when clicking the + the first time, click on the 0 to change it to the value you want. When clicking the + thereafter, it will add scores following this initial value. To delete a rating, simply click on the blue Delete word (under Add Benchmark) for the rating you wish to delete. IMPORTANT: A criterion set up with single ratings will have a drop-down list of the possible scores to use where you enter data. If the criterion will have a greater number of possible scores (like 0-30 for example), it might be best to set it up with one rating having a range of scores from 0 to 30. IMPORTANT: A criterion with a score range (one rating - but a range of scores) will offer a text field box where the score will need to be typed in for data entry. It will not have a drop-down. To set a range of score for a criterion, click on Numeric Scale after one rating has been added. Set the beginning and end values of the range. Click on 'Record' when you are done. If the range of score actually needs to be broken down by proficiency levels, you will need to have the same number of ratings as you will have proficiency levels. In the following example, there will be 4 ratings - set up as 4 ranges to be able to have each one associated with a particular proficiency level. When clicking on Add Scale, you will get the list of the scales that are available. Click on the scale you wish to add. Click on Add Scale for the criterion you wish to edit and select Proficiency. It will add a row called Proficiency. To edit the proficiency, click in the row, then click under the score range you wish to assign a proficiency level. It will open the list of proficiency levels. Just click on the appropriate one to set. When you are done and want to get out of edit mode for the proficiency scale, just click anywhere outside of that row. If you ever wish to completely remove the proficiency scale row (entire row), click on the red minus sign to the right of the row. If you wish to move the divider, click on the <|> blue symbol between the red X symbols, it will set the 'movement mode' for that divider and all the little knobs will turn blue. No more green ones. See below. In 'movement mode', you can move a divider anywhere you wish to by simply clicking on the little blue knob where you need it to be. Once you click, the dividers show in blue, and the other knobs between ratings return to their green color. Once you have the ranges set (all the dividers in place), click in that range within the proficiency row to set its proficiency level. When you are done and want to get out of edit mode for the proficiency scale, simply click anywhere outside of that row. Click on Add Description; it will add a row with text boxes to type in the description for each rating (or score range). The Rating Description Field expands vertically as a whole row when being edited. When hovering over the gray shaded bar below the rating description fields, an up and down arrow will be displayed. Just click on it to move up or down to either shrink or expand all of the rating fields at once. Click on Add Sub Criterion and select one criterion to add a sub criterion, or select Add All Sub Criteria for all of them. Weight is used to summarize multiple values (scores) into one value on the Unit Reports. By default, the system gives an even weight to each criterion within a unit. You only need to change the weight if you wish to not have it evenly distributed. Based on the weight given to each of the criteria, the first scenario gives you a calculated score of 2.8. This score would be the score showing on this Unit Report. In the second scenario, the score of 1.9 would be the score appearing on the Unit Report. In the third and last scenario, the unit would be summarized by a score of 2.1 in the Unit Report. Without any specific weight associated with each criterion (by default the weight is evenly distributed between all criteria), the calculated score would be the average of all three scores (4+2+1= 7 then 7/3=2.33) therefore, it would be 2.33. As you can see, based on weight, the calculated score that will show on the Unit Summary Report will vary. To be clear, that calculated score is NOT a new score, it is only a way of summarizing the scores of all criteria into one single value for that unit. 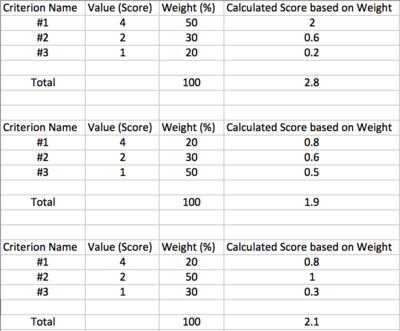 When the weight is evenly distributed between all the criteria of a unit, the summarized score for that unit is the average of all the scores. When a unit contains several criteria but only one is of primary importance in the Unit Report, that one criterion will be given a weight of 100% and all the others will have 0%. This is often the case, for example, for an assessment where Total Score is the one criterion chosen to give a quick snapshot of information in the Unit Report therefore, it has a weight of 100%. The system, by default, gives all criteria a value of 1 which distributes their weight evenly. If this is how it should be, then you can leave the weight as is. If you need to adjust the weight, in the Working Version or Edit Mode of the Current Version, click in the Weight field to change the value. Type in the specific value (percent) you wish each criterion to have (Example: 30 for 30%). The added weight of all criteria should total 100. If by mistake it doesn't, the system will recalculate and distribute the weight to total 100%. If you wish to have only one criterion with 100% of the weight, change all other criteria weight values to 0. By default, the term for each criterion is set to 'Year'. To change the terms for all criteria in the unit, click on Edit All Terms above the first criterion. Check the term(s) you need, hit Apply. To change the terms for one criterion, click on the word Terms within that criterion settings and check the term(s) you need. Click on the word Description between Standards and Type to add a description for the criterion. A unit needs to have a rubric with a Current Version in order to be available for data entry. 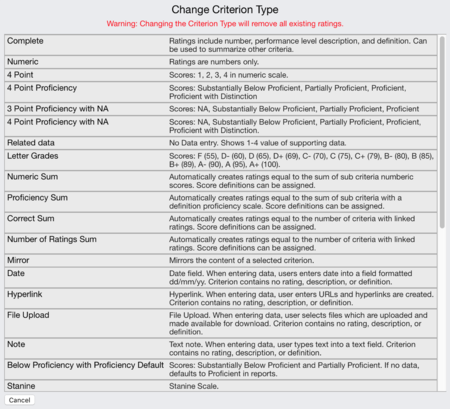 Once you are done building/modifying the Working Version of a rubric, it has to be approved in order to become a Current Version and be available for data entry. To do that, click on Approve, in the top menu row. A separate confirmation dialog will appear. Please, take the time to read what it says and proceed by either hitting Cancel or Approve to make this working version a current version. See example below. It is important to protect the evolution of an assessment (unit). Over time, the assessment might changed in what is being measured, and/or how it is being measured. The curriculum versions give you the ability to preserve this process while keeping the historical data intact. A working version is a new version being worked on. There is only one allowed at any given time. Preview allows you to view what this version will look like when it is approved (current). Approve will make this working version the current version, and at the same time, will retire the existing current version if there is one. This is a working version upgraded to a draft version for review - multiple drafts are allowed. A current version can be one draft version OR one working version upgraded to current when it was approved - only one current version is allowed at any given time. Only current versions are visible to users and available for data entry. If there is already a working version in this unit, Copy will only allow you to create a new working version in a separate unit. Create Working Version will ONLY be an option if the current version doesn't already have a working version. 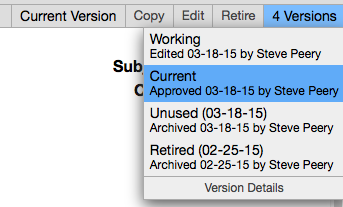 Retire allows you to retire a current version so it will no longer be available for data entry. A retired version is an old current version that got automatically retired either when a new working version was approved and became current OR directly retired without any other current version available. Copy allows you to create a new working version within this unit if none already exists OR a new working version in a separate unit. Edit again allows you to create a new working version within this unit if none already exists OR allows you to edit this retired version. If data has been entered in this version, a warning with a red background will be displayed. An unused version is one of the draft versions upgraded to unused at the time when one of them was approved and became current. A unit can have multiple versions. When it does and you wish to view a different version, click on Versions on the top right (the # preceding indicates how many versions this unit has) and select the version you would like to view. If you click on Version Details, it will provide you with information about each version, and it will also indicate if each one can be deleted or not. This is a convenient feature to delete unwanted working version for example. Select the unit you wish to approve - it can either be a Working Version or a Draft Version. A Confirm Approve dialog will appear with the options to Cancel or Approve. When approved, a Working Version will become Current, and if there was already an existing Current, it will be automatically Retired, and a Draft Version (if any) will be marked as Unused. When approved, a Draft Version will become Current, and if there was already an existing Current, it will be automatically Retired. A Working Version (if any) will remain a Working Version. Only approved curriculum - therefore CURRENT versions - will be visible to users and available for data entry. Click on Select Information. Use the filters at the top to narrow down the list presented to you. Click on the curriculum course to see the curriculum units it contains. Click on the curriculum unit you are interested in. If the unit you selected is available to you for data entry, you will be prompted by a calendar, hit cancel. Click on Curriculum to see the curriculum page. Click on Rubric to see the detail of the assessment (what is being measured and how it is measured). Click on Assessment to access any attachments (e.g. worksheet, scoring guide,...) that may be available, task details, materials, and any additional directions. If you have FULL Access or Curriculum Development Access, you can also view the curriculum under the Develop Tab. You can click on All Units and use the filter to locate the course/unit you're interested in in the list. Then hover over the unit name and click on it to go right to it OR you can navigate in the left column by clicking on the triangle to open the folder and course you're interested in, and clicking on the unit you wish to go to. 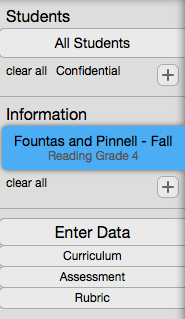 When you have selected a unit, you will see three tabs: Curriculum, Assessment, and Rubric. The Curriculum tab will bring up the curriculum page. The Assessment tab will bring up a page where you can access any attachments (e.g. worksheet, scoring guide,...) that may be available, and information on task details, materials, and/or any additional directions if provided. 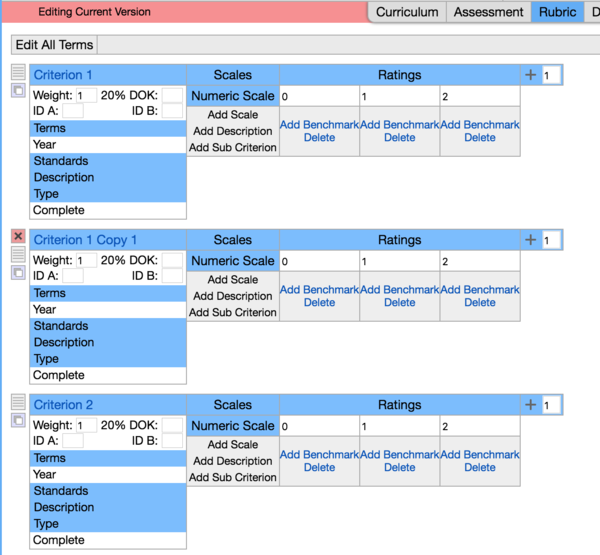 The Rubric tab will bring you to the detail of the assessment (what is being measured and how it is measured). 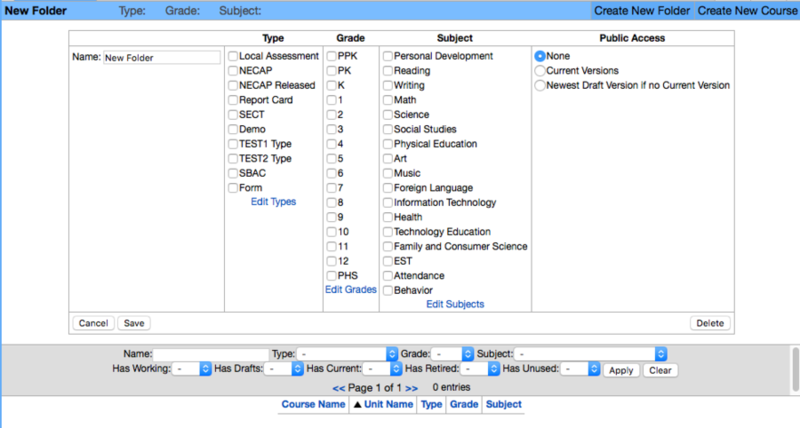 The Types, Grades, and Subjects linked to a unit are directly connected to the Types, Grades, and Subjects in the Access Sets. A least one Type, one Grade, and one Subject are needed for every unit, but it can also have multiple ones. Those three elements may or may not be inherited from the course and/or folder in which the unit is located. When the checks are GRAY, they are inherited either from the course it belongs to, or the folder it's in. You need to select the level where those elements have been set in order to be able to edit them, if needed. You can add more checks (type, grade, and/or subject) but can't changed the existing ones in this case unless you select the course and/or folder. After making any changes to the Type, Grade, Subject, click on the Save button to save the changes. The blue 'Edit Types', 'Edit Grades', and 'Edit Subjects' allow you to edit the name of the existing ones listed, as well as the ability to delete or add new ones to the list. By default, there is no public access to any curriculum. For your SU/SD, you can choose to make any Folders, Courses, and/or Units public. When you do, ONLY the curriculum pages become public. Public Access is granted, or removed when you no longer wish to make it public, under the Develop tab. Click here to find out how to make curriculum public. Click here to learn how to remove public access that was granted to your curriculum. Click here to learn how to access public curriculum; your own and other SUs. In order to edit the curriculum, you have to be on the Develop tab. When on the Curriculum tab, click on the Edit button if the curriculum page you wish to edit is in the current version. If the version is a Working Version, you are already in Edit mode and can make the changes needed right away. 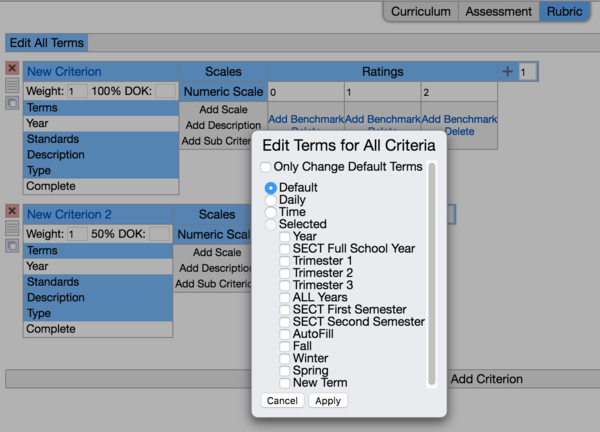 To add a criterion in a Current Version of an existing rubric, click on Rubric tab, Edit button, and select Current Version. You can add a criterion by copying an existing one OR simply adding a new one by clicking on Add Criterion at the very bottom of the rubric. On the left side of the criterion name, there is an icon like this: . This is the 'Copy' icon to use if you wish to copy a criterion. When you click on the Copy icon, a Copying Criterion dialog will come up to allow you to set how many times you want this criterion to be copied, and where the copies should be placed. The copies can show up after the criterion you're copying or at the very end of the rubric. Once you have decided and selected, click on Copy Criterion button. The copy you made will be labelled with the word 'Copy' in addition to its original criterion name. Click on the criterion name to edit it. Click on Done to close the editable field when you are done. If you need to move the criterion to change the order, click on the little icon on the left to drag and resort. 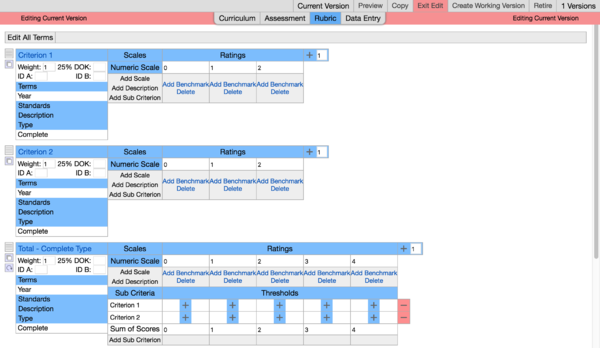 It may take more than one attempt as the drag feature only allows you to move the criterion within the part of the rubric that you see on your screen. Click on Add Criterion at the very bottom of the rubric. Click on How to Add a Criterion to learn more about how to set it up. In a Working Version, under the Rubric tab, click on the red X to the left of the criterion you wish to delete. In a Current Version, no criterion with data should ever be deleted. The red X to the left of the criterion should only be available for the criteria without any data. Clicking on that red X will delete the criterion. To reorder a criterion, place your mouse over the dragging handle symbol to the left of the criterion - you will see an up and down arrow appear - click and hold down to drag the criterion, and release when you're done. If you have to move the criterion beyond the criterion list visible on your screen, you will need to repeat these steps. To copy a criterion, click on the Copy symbol on the left side of the criterion. A Copying Criterion dialog will come up to allow you to set how many times you want this criterion to be copied, and where the copies should be placed. Click on the Copy Criterion button. The criterion will be copied and the word 'Copy' will be added to its name. By default, +1 is set for the criterion and if you click on the +, it will add one rating with the next numeric value. If it's a new criterion, the rating will start at a possible score of 0. You can keep clicking the + to add one rating at a time or you can change the 1 for the number of ratings you wish to add before clicking the +. To delete a rating, simply click on the blue word 'Delete' (under Add Benchmark) for the rating you wish to delete. Click on Standards to learn more on how to link standards to criteria. Click on Weight to learn more. Type in the information in the box to the right of DOK. To change the terms for all criteria in the unit, click on Edit All Terms above the first criterion. Check the term(s) you need, hit Ae apply. To change the terms for one criterion, click on the word Terms within that criterion settings and check the term(s) you need. If the term you need is not listed, it will have to be created before it can be selected. To learn how to create a new term, click Terms. This description is used to provide more information about the criterion. To add or edit the criterion description, click on the word Description with the blue background, right below the Standards. This description is used to provide more information about the ratings of the criterion. To add or edit the rating description, click on the Add Description, below Numeric Scale. To link sub criteria, click on Add Sub Criterion, under the Numeric Scale. Select Add All Sub Criteria, or pick an individual criterion. If you select individual ones, you need to click on Add Sub Criterion prior to making each single selection. If the type of criterion you are adding sub criteria to is 'Numeric Sum', the system will automatically add the correct number of ratings based on the sub criteria linked. At this time, only the criterion type '4 pt proficiency with NA' offers the Supporting Data feature. Click on Supporting Data (below Standards), check the appropriate supporting data, hit Save. In order for the supporting data to come through to the criterion, that supporting data needs to have a proficiency scale. It is the proficiency level that is used as supporting data. Click on Add Benchmark (in blue) under the rating you wish to link a benchmark to. Choose the file to be used as benchmark, click Upload, and hit Save. Thresholds can only be set when sub criteria have been linked to a criterion. If the total score of the sub criteria is what is important (and not the score for each particular criterion), type in the values in the Sum of Scores row. See example below. If the score of a particular sub criterion is what is important, click on the blue + under the Numeric Scale rating, and type in the score in the left cell. Below is another sample of how thresholds can be used. Thresholds can get very confusing and complicated. Please, do not hesitate to contact VCAT Support for guidance. Select the unit for which you want to edit the assessment page. 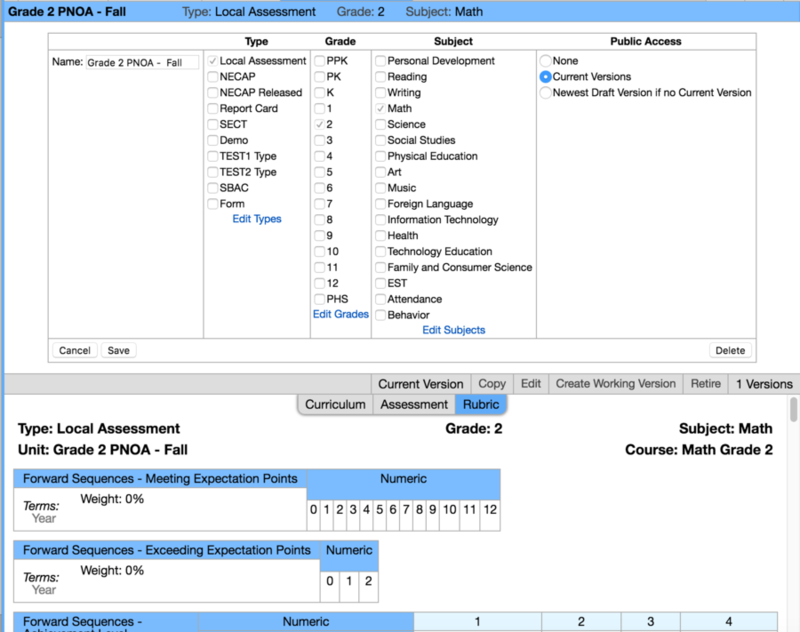 If you want to Edit the Assessment Page of a Current Version, click on Edit, in the top row options, and select Current Version. If the version is already a Working Version, you can edit right away. Click on Assessment Page to learn more. Select the unit for which you want to edit the curriculum page. Click on the Curriculum tab. If you want to Edit the Curriculum Page of a Current Version, click on Edit, in the top row options, and select Current Version. Click on Curriculum Page to learn more. Hover over to the right of the folder/course/unit you wish to move to a different location. You should see the Move option. Click on the Move option. Depending if you're moving a unit, a course, or a folder, you will see acceptable locations displayed with a white background. Moving your cursor away from the unit you wish to move and the unit will be highlighted in orange, indicating that the move option has been initiated for it. If you no longer wish to move the selected unit (or folder/course), clicking on it when it is highlighted in red will cancel the initiated move. If you're trying to move a unit, for example, and the course you wish to move that unit into is not showing, click on the arrow in front of the folder where the course is located to allow you to see the course (destination of the unit). Move your cursor to the destination (folder/course), and click on it when it is highlighted in blue and it will move into it. If any curriculum (Folder, Course, Unit) has been created by mistake or was NEVER used (doesn't have any data), it can be deleted. Select the Folder you wish to delete. Click on the top bar to get the drop-down with the Delete option (bottom right). Click on Delete. You will get a confirmation dialog - when you click on Delete in the dialog, it will permanently delete the Folder AND all the Courses AND all the Units it contains. Select the Course you wish to delete. Click on the top bar to get the drop-down with the Delete option (bottom right). Click on Delete. You will get a confirmation dialog - when you click on Delete in the dialog, it will permanently delete the Course AND all Units it contains. Select the Unit you wish to delete. Click on the top bar to get the drop-down with the Delete option (bottom right). Click on Delete. You will get a confirmation dialog - when you click on Delete in the dialog, it will permanently delete the Unit. In order to have curriculum/assessments available to teachers for data entry, that curriculum needs to be linked to the student groups at the course level. Select the year, the school, and the course (e.g. Grade 3, Math 4, Literacy 5,...). Click on the little ' i ' icon that shows up when your mouse hovers over the course selected, OR click on Course Info in the left column. The curriculum courses listed in the Linked Curriculum Courses are the ones currently linked to the course selected. In the Linked Curriculum Courses section, click Add or Remove Curriculum. Note: Any curriculum already linked will show below the line under Add Selected Curriculum. Select Type, Grade, and/or Subject to populate the list of curriculum/assessments available. Check the curriculum you wish to link. Click on Add Selected Curriculum. It will move the curriculum you just selected below the line under Add Selected Curriculum. If you need to link a different curriculum that didn't show up in the list of curriculum available, change your filter for Type, Grade, and/or Subject to re-populate a new list. Again, check the curriculum you wish to add, and click on Add Selected Curriculum. If you are done adding curriculum, click on Done Editing button at the bottom left of the Link Curriculum Courses section. Then click on Save Changes below. Click on Course Info in the left column. Note: The curriculum already linked is listed below the line under Add Selected Curriculum. Check the curriculum you wish to unlink. Click on Remove Selected Curriculum. Click on Done Editing button at the bottom left of the Link Curriculum Courses section. Under the Develop Tab, the Export feature is available for 'FULL ACCESS' users only. 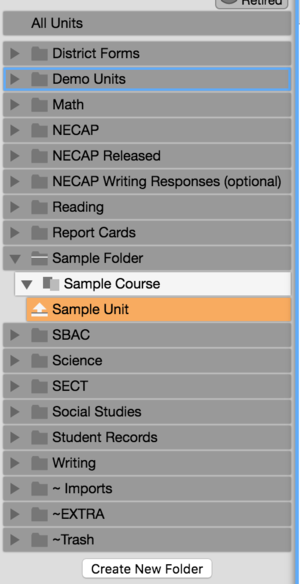 The Export Curriculum feature is used to duplicate Folders, Courses, and their Units within the same system but, it is mostly used by VCAT Support personnel when curriculum is shared between SUs and/or School Districts. The exported curriculum is ultimately imported using the Import Curriculum feature. IMPORTANT NOTE: the Export option does NOT keep supporting data links. If there are any criteria linked to supporting data in unit(s) and you wish to keep those links, it is recommended you use the Copy feature for the unit(s) instead of the Export. The Copy feature can create a new unit with a copy of the version selected as the Working Version, and it will keep the supporting data links. 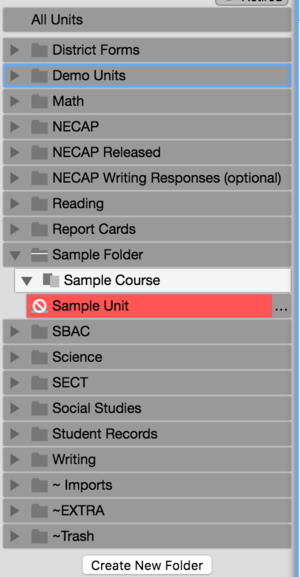 When you have a folder, course, or unit selected, the Export button at the top right of the screen will allow you to EXPORT and/or PRINT the curriculum. When you have a Folder selected, the Export options are: Export Folder and Print Unit Pages. Export Folder will allow you to export the folder and all the courses and units part of that folder. This option could be use if the entire folder and its content needed to be duplicated using the Curriculum Import feature. This option is commonly used by VCAT Support personnel when curriculum is shared between SUs and/or School Districts. IMPORTANT NOTE: the Export option does NOT keep supporting data links. If there are any criteria linked to supporting data in unit(s) and you wish to keep those links, it is recommended you use the Copy feature for the unit(s) instead of the Export. The Copy feature can create a new unit with a copy of the version selected as the Working Version, and it will keep the supporting data links. 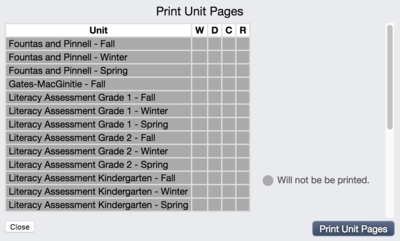 Print Unit Pages will allow you to print the Curriculum page, Assessment page, and/or Rubric page for all the units and all unit versions, or specific ones, of the folder selected. By default, none of the versions (W-Working, D-Draft, C-Current, R-Retired) are selected therefore, they are grayed out. Scroll down to see the other half of this window to view and edit the Versions and Pages selections. In the example below, 'Current' under versions has been selected, and the Rubric is the only one left selected to be printed. Clicking on Print Unit Pages will print what is selected. When you have a Course Folder selected, the Export options are: Export Course and Print Unit Pages. Export Course will allow you to export the course and all the units part of that course. This option could be use if the entire course and its content needed to be duplicated using the Curriculum Import feature. This option is commonly used by VCAT Support personnel when curriculum is shared between SUs and/or School Districts. IMPORTANT NOTE: the Export option does NOT keep supporting data links. If there are any criteria linked to supporting data in unit(s) and you wish to keep those links, it is recommended you use the Copy feature for the unit(s) instead of the Export. The Copy feature can create a new unit with a copy of the version selected as the Working Version, and it will keep the supporting data links. 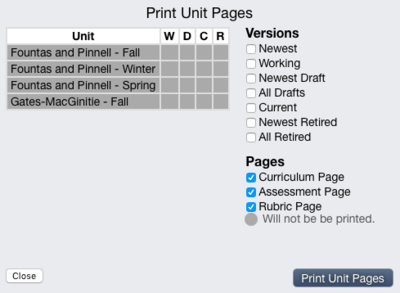 Print Unit Pages will allow you to print the Curriculum page, Assessment page, and/or Rubric page for all the units and all unit versions, or specific ones, part of the course selected. By default, none of the versions (W-Working, D-Draft, C-Current, R-Retired) are selected therefore, they are grayed out. Check the version(s) and uncheck/check the pages you wish to print. Click on Print Unit Pages. 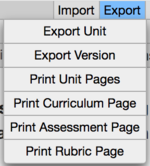 When you have a Unit Folder selected, the Export options are: Export Unit, Export Version, Print Unit Pages, Print Curriculum Page, Print Assessment Page, and Print Rubric Page. Export Unit will export all the versions part of the unit. The option to import only a specific version will be available with the Import feature. This option could be use if the unit needed to be duplicated but the Curriculum Import feature would need to be used as well. This option is commonly used by VCAT Support personnel when curriculum is shared between SUs and/or School Districts. IMPORTANT NOTE: the Export option does NOT keep supporting data links. If there are any criteria linked to supporting data in unit(s) and you wish to keep those links, it is recommended you use the Copy feature for the unit(s) instead of the Export. The Copy feature can create a new unit with a copy of the version selected as the Working Version, and it will keep the supporting data links. In the example below, there is only a Current version but if there were other versions, they would also be listed and exported. Export Version will export only the version that you have selected. If the unit has multiple versions, whichever version you're on is the one that will be exported. 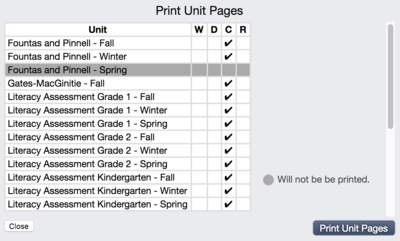 Print Unit Pages will bring you directly to all the pages to be printed: Curriculum Page, Assessment Page, and Rubric Page. If you wish to print a specific page, select the option to print that specific page (Print Curriculum, Assessment, or Rubric Page). Print Curriculum Page will bring you directly to the Curriculum Page to be printed. Print Assessment Page will bring you directly to the Assessment Page to be printed. Print Rubric Page will bring you directly to the Rubric Page to be printed. Under the Develop Tab, the Import feature is available for FULL ACCESS users only. The Import Curriculum feature is used to duplicate Folders, Courses, and their Units within the same system but, it is mostly used by VCAT Support personnel when curriculum is shared between SUs and/or School Districts. 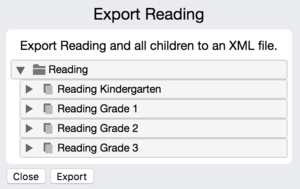 The file used for the Import Curriculum has been initially exported using the Export Curriculum feature. • Under the Develop Tab, click on Import and Import Curriculum on the top right. • Click Choose File to go select the previously exported curriculum file and click Upload. • In the Import Curriculum window, there are 3 sections: the left section shows what curriculum is uploaded, the middle section shows its curriculum name, where it has to be imported, and a variety of import options, and the right section lists the curriculum in your system from which you will need to pick the destination of the curriculum you are importing. • By default, 'All Versions' is selected next to Import in the middle section. This option allows you to import All versions or any other specific version. • In the example below, the Current Version is the selected one to be imported, and the 'Do not change' option means that the Current version being imported will not be changed and will remain Current. • The Add Handler for Version Type is seldom used but exists to have the flexibility of separate import instructions for each version being imported when needed - when more than one version is being imported and each version has its own special import instructions. 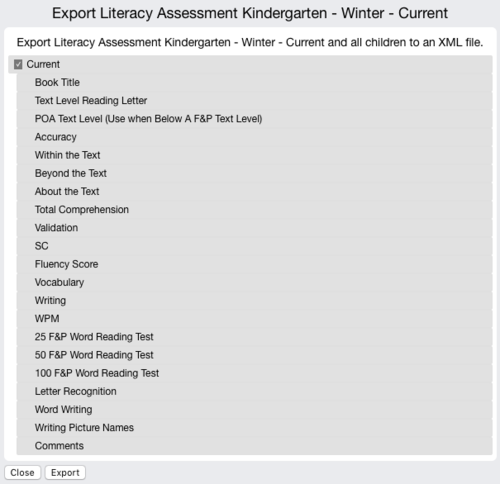 • In the middle section of the Import Curriculum window, the system indicates where the kind of curriculum uploaded has to be imported: 'Insert "Local Literacy Assessment Kindergarten" into a Folder - so, on the right side of that window, a Folder (Reading) has been selected and becomes the destination. NOTE: A Curriculum Folder needs to be imported into a Folder, a Curriculum Course needs to be imported into a Folder, and a Curriculum Unit needs to be imported into a Course. The system will only accept an appropriate destination. Inappropriate destinations will be grayed out. • To finalize the import, click on Import on the bottom left - or Cancel to cancel this import. Import Completed will be displayed for a successful import. FULL ACCESS users have the ability to print unit pages (Curriculum Page, Assessment Page, Rubric Page) for an individual unit or multiple units within a Folder or Course under the Develop Tab using the Export feature. They can also print curriculum under the Data Tab like other users. 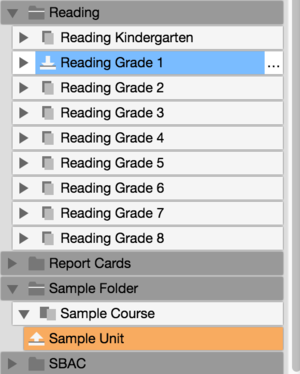 OTHER users can print a Curriculum Page, an Assessment Page, and/or a Rubric Page (one unit at a time) for the single piece of information (one unit/assessment) they have selected under the Data Tab. Users (without Full Access) are able to print the CURRENT version of a unit they have view access to, and the latest version (what was the current version before the unit was retired) of a completely RETIRED unit. • Click on Select Information and select the unit you wish to print the Curriculum Page, the Assessment Page, and/or the Rubric Page. NOTE: If the unit you wish to print curriculum for has been completely retired, it will not be listed by default. You will need to check the 'Show Retired' box in the filter options at the top in order to display the unit and have the ability to select it. • Click on either Curriculum, Assessment, OR Rubric. 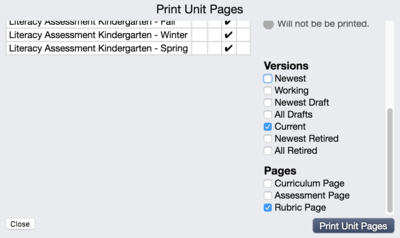 • Print Unit Pages will bring you directly to all the pages to be printed: Curriculum Page, Assessment Page, and Rubric Page. 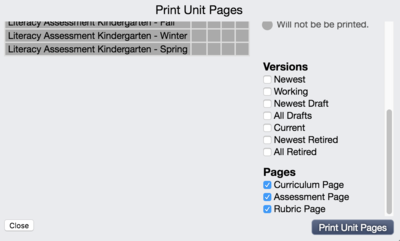 If you wish to only print a specific page, select the option to print that specific page (Print Curriculum Page, Print Assessment Page, or Print Rubric Page). • Print Curriculum Page will bring you directly to the Curriculum Page to be printed. • Print Assessment Page will bring you directly to the Assessment Page to be printed. 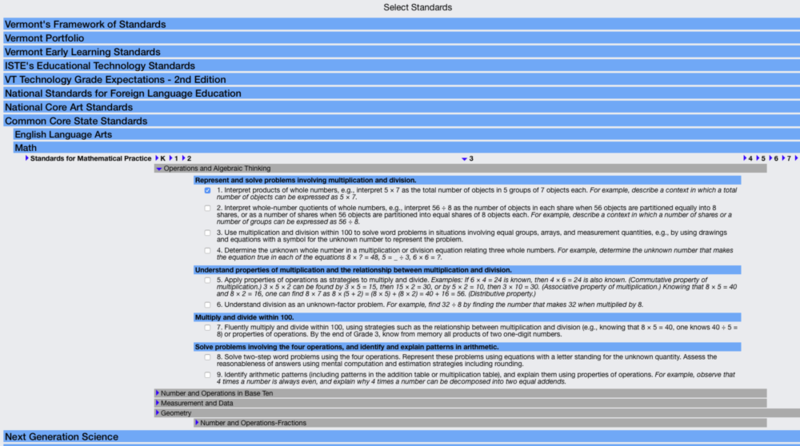 • Print Rubric Page will bring you directly to the Rubric Page to be printed. This page was last modified on 12 February 2018, at 14:02. This page has been accessed 163,849 times.